Spiders have a well-established but largely undeserved reputation as being dangerous to the health of people and their pets. In truth, spiders are extremely beneficial because they prey on many insects that we consider to be true pests in our homes and gardens. Not all spiders build elaborate webs to catch their prey. Some species ambush their prey from tubular tunnels (Figure 1) built in the ground, under rocks or other areas. Other species simply build a loose collection of webbing in which they live. 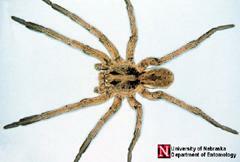 These types of spiders, such as the wolf spider (Figure 2), are the ones that most frequently invade homes. They may remain hidden for most of the day, then hunt for prey at night. Figure 1. 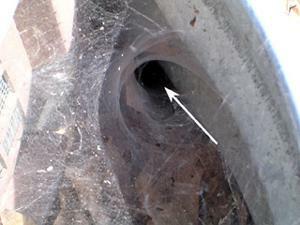 Some spiders build funnel-shaped webs on the ground, near vegetation or near buildings (such as the foundation vent well shown here). The spider hides in down in the narrow end of the and rushes out to grab prey that wander by. Spiders are not insects. They are close relatives of ticks, mites and scorpions, which all belong in the group called arachnids. Unlike insects, which have three main body sections and six legs, spiders have two body sections and eight legs (Figure 3). 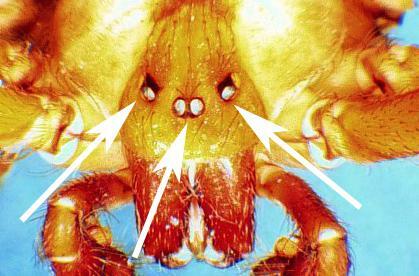 The eyes, mouthparts (Figure 4) and legs are found on the front section of the body, known as the cephalothorax. The second section, the abdomen, bears the parts of the respiratory system (spiracles and / or book lungs depending on the type of spider), the digestive and reproductive systems, and the external organs used for spinning silk or webbing. Most spiders are identified by size, color, markings on the body, and the number (usually six or eight) and arrangement of eyes. Female spiders wrap their eggs in a silken spun sac. Some spiders carry this egg sac, while others deposit it somewhere within their nest. Hatchling spiders (spiderlings) often produce a silk thread that allows them to disperse by "ballooning," i.e., being blown by wind currents to other areas. Figure 3. A spider's body is divided into two parts. 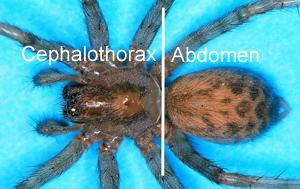 The cephalothorax is the fused head & thorax. The legs are located on the cephalothorax. The abdomen is similar to that of insects. Figure 4. Spiders have mouthparts known as "chelicerae" on which you will find their fangs. Encounters between people and spiders are usually accidental and bites are a response by the spider when its web or nest (or the spider itself) is disturbed. Most spiders produce venom therefore, they could be considered "poisonous." 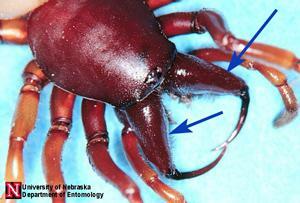 The venom is stored in glands that empty into the spider's fangs or chelicerae (Figure 4). For the most part, spider bites are insignificant. However, just as bee and wasp stings may trigger allergic reactions in some people, the same can be true for spider bites. Young children, the elderly, and hypersensitive individuals are more likely to react more strongly to a spider bite. In North Carolina, there are few spiders that can inflect serious and painful injury. The two best-known poisonous spiders found here are the black widow spider and the brown recluse. 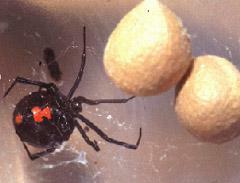 The black widow spider (Figure 5), Lactrodectus mactans, is probably the most widely recognized of the dangerously poisonous spiders found in North Carolina. Most people are familiar with the large, shiny black body and red "hourglass" markings on the underside of the abdomen, but it is important to note that the coloration and markings are only found on adult females. Young black widow spiders are tan-to-gray in color and have orange and white stripes on their abdomens. These marks may remain visible on adults. The female has a body length of about 1⁄2 inch, with a total length (including legs) of about 11⁄2 inches. The male spider is smaller than the female and, like young spiders, has red and white markings on the back of its abdomen. Black widow spiders are found in protected places, such as under rocks, wooden boards, and in dense plant growth. They frequently nest in electrical, water, and telephone equipment boxes outdoors. Around homes, these spiders may be found in crawlspaces, beneath appliances, and usually in corners that are dark and damp. The female produces an egg sac containing 250-750 eggs that hatch in two to four weeks, depending upon temperature. The spiders spin a web that is used to ensnare prey, mostly insects, but sometimes other spiders as well. The trapped victim is bitten, then injected with venom to paralyze it. Black widow spider venom affects the nervous system. Because the bite itself is relatively mild, some people may not even realize immediately that they were bitten. The venom causes pain in the lymph nodes. Other symptoms of a severe bite include nausea, elevated blood pressure, sweating, tremors, and increased white blood cell counts. The wound may appear as a bluish red spot, surrounded by a whitish area. Both male and female spiders bite, but adult females produce the most severe bites. An antivenom serum is available through a physician, but it must be administered soon as possible after the bite occurs. There are actually several species of "recluse" spiders. The one that is found most commonly in the eastern United States is Loxosceles reclusa. The adults are about 1⁄4-1⁄2 inch in length. Most people rely on seeing the familiar dark violin or fiddle-shaped mark on the top of the cephalothorax (Figure 6). The "neck" of the fiddle points toward the rear of the body. However, there are several species of brown-colored spiders that have markings that can easily be confused. The key characteristics of the recluse is the arrangement of its six eyes into three pairs (Figure 7). Brown recluse spiders are nocturnal in their feeding habits. Outdoors, they are most common under rocks, debris, wood piles, etc. Indoors, common hiding places are bathrooms, attics, cellars, and storage areas. Problems most often occur when people are accidentally bitten by a recluse hiding in stored clothing, inside shoes / boots, or cardboard cartons. The hands, underarms, lower abdomen and the ankles are the areas of the body most likely to be bitten. 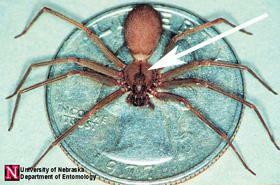 Although brown recluse spiders can be found in North Carolina, they are simply not very common. There are several spiders that closely resemble the brown recluse. Misidentification can cause unnecessary fear and anxiety. The article Identifying and Misidentifying the Brown Recluse Spider by Rick Vetter (University of California - Riverside) talks about recluse misidentification. Also, "identification" of brown recluse spider "infestations" is often based on what appears to be a bite. While recluse bites are somewhat characteristic (see information below), other diseases caused by a variety of pathogens, particularly bacteria such as MRSA, may create wounds that look like a brown recluse bite. Whether it is a brown recluse bite or another organism, always seek prompt medical assistance. A brown recluse bite may go unnoticed for 3-8 hours, before the bite area reddens, swells and becomes tender. Blistering of the wound will start to appear. In some instances, a bite victim may become feverish and feel nauseous. A necrotic lesion (i.e., an area of dead skin tissue) may develop and require surgery (Figure 8). Although an antidote has been developed, it is not widely available and it appears to be most effective before the lesion develops. In some cases, antibiotics and the drug Dapsone may be used successfully to treat the bites without surgery, but these decisions are made after careful diagnosis by a doctor. Prompt medical attention is critical to successful chemical or surgical treatment of the bite. Figure 5. Female black widow spider. Figure 7. Brown recluse eye placement. Figure 8. Brown recluse bite. Spiders are beneficial and control many insects that feed on the flowers, shrubs and other plants in our gardens and natural areas. Spraying for spiders in these areas may actually increase the number of pests by killing off other natural enemies as well. Web-building spiders are most likely to show up in areas where insects are abundant, e.g., wood piles, around porch lights, windows or water sources (such as water spigots). Knocking down these webs with a broom or burst of water from a garden hose is adequate for "control." Outdoor pesticide applications for spiders are largely unnecessary and should be avoided. On occasion, you will find spiders on objects or in areas that have been left undisturbed; this can include sandboxes or even children's toys. Check these items periodically for signs of spiders. Spraying pesticides around sandboxes or other play areas should be avoided whenever possible. The yellow garden spider, Argiope aurantia is one of the araneid or "orb weaver" spiders that builds the widely recognized circular spider web in which they snare their prey. Argiope aurantia is a common, distinctively colored (black and yellow), large spider that is frequently seen in the fall in gardens, yards and along roadsides. The female (Figure 9) builds a web that has a conspicuous zig-zag band of white silk in the center of the web. For this reason, these spiders are often called "writing" spiders. For more information about spiders in your garden, read Common Spiders in the Landscape. Sanitation - reducing or eliminating conditions that attract insects, e.g., high moisture and ready access to food of some sort. Exclusion - find the entry points used by both insects and spiders and seal or close these areas. There are a number of short-term solutions to spider infestations as well. Knocking down and removing webbing, or mechanically removing / killing the spiders should be sufficient. Vacuum the areas along baseboards, in corners and under and behind furniture. Clean bookshelves periodically. If you're concerned that more spiders will show up (or hatch from an unseen egg sac), then you could resort to applying an insecticide along baseboards, in corners, and inside storage closets. Select a pesticide that is labeled for use against spiders indoors. Always read the insecticide label for complete instructions on how and where to use the product. Crawlspaces are often attractive environments for spiders (but not necessarily the source of spiders entering your living area). Treating your crawlspace is an option, but simply setting off foggers ("bug bombs") is not likely to be effective and can be hazardous particularly if you contaminate your heating / AC ventilation system. Crawlspace treatments, if needed, are often best left to pest control professionals. The availability of particular insecticides may change from year to year, so consult the latest edition of the North Carolina Agricultural Chemicals Manual or your local county Cooperative Extension office for advice on selecting insecticides. Figure 9. 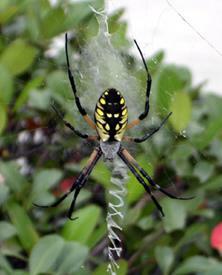 Yellow garden spider. Always check for spiders before sticking your bare hand(s) into dark corners or areas where you can't see your fingertips. Always wear work gloves when handling boxes, firewood, lumber, and other items that have been left in storage undisturbed for signficant periods of time. Vigously shake clothing and shoes that have been left undisturbed for some time to dislodge any spiders and inspect them before wearing. If you think you have been bitten by either a black widow spider or brown recluse, carefully apply ice or a cold-pack to the bite and seek medical assistance. If you can catch the suspect spider, bring it along for positive identification or take it to your local county Cooperative Extension office for identification. Goddard, J. 1993. Physicians Guide to Arthropods of Medical Importance. CRC Press, Boca Raton, FL. Kaston, B. J. 1953. How to Know the Spiders. Wm. C. Brown Co., Dubuque, IA.